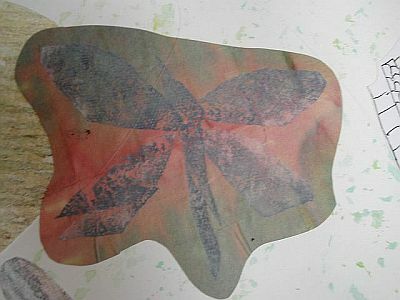 This dragonfly is made from painted nappy liner, heated till it is distressed and then cut up and stuck on a piece of paper which I hade dyed with green ink and red food colouring. This was one of those spur of the moment, playing around things which turned out more successfully than some of the heavily planned and designed pieces on the board! (PS. Is anyone reading this today? It has been very quiet this week – I feel as though I’ve been talking in the wilderness! I shall soldier on, however, and pretend I am writing in my diary, which I suppose is what this blog is really). You are top of my blogs I like list and I am reading you! I love working with nappy liners too…they are such fun! liz, i’ve been meaning to ask you about the city & guild online workshops…i think i read that you where taking these. i went to the website but couldn’t find the cost of enrollment or courses. do i just need to email for the info or am i missing it online. THANK YOU, everyone, for reassuring me that you are still there and for your nice comments. Jeannie, nappy liners are diaper liners – the thin pieces of disposable paper (not quite paper but a bit like garden fleece …hmm, wonder if that’d work too?!) which are used with cloth diapers to – erm – stop the solid matter from getting completely squidged on to the diaper… I assume. Anyway, you can paint on them and heat them with a heat gun and they can be used to make interesting textures. The latter has lots of links to all sorts of courses and if you explore http://www.textilearts.net there are lots of useful links to other textile-related things. If you want to know any more about online City & Guilds courses generally, there’s a Yahoo group – http://groups.yahoo.com/group/cityandguilds/ – mostly embroiderers but also patchwork and quilting people on it and they’re very friendly! I’m here, too and loving your work, as always! Company just left so I should have a bit more time to myself. Hooray!